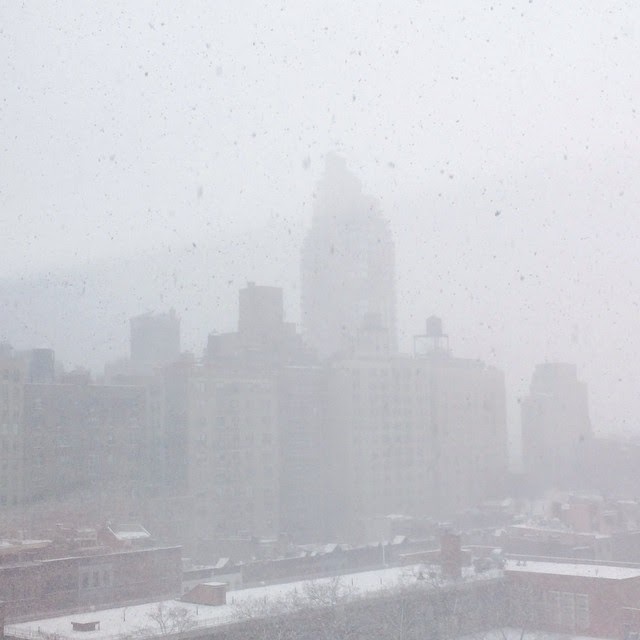 Stranded in NYC: Do You Wanna Build a Snowman? I love New York, & I have a lot to say about it. A post has been percolating for the last eight days, forming in my mind as I walk the streets of Brooklyn & Manhattan. I look forward to writing that piece soon, but today is not that day. Let's be clear: There are much, much worse places to be stranded than in what is arguably the greatest city on earth. If you're gonna get stranded in someone else's city, it's best to find yourself in one full of people you know & love. After two canceled flights, I was fortunate to have been offered a place to stay by no fewer than four friends. Currently, I'm holed up on the Upper West Side with my mom's cousin, his wife, & their two adorable boys. We're eating homemade lasagna & spying on neighbors & planning to make snow ice cream, & it's pretty lovely. Still, if one more person tells me how lucky I am to be stranded in New York City during the supposed storm of the century, I am probably going to cry. Again. I've already done it, like, three times, out of the sheer frustration of being stuck in a place that I'd planned to leave today. And, while I appreciate the positivity, I am really maxed out on other people's silver linings: "But you're with family!" "But it's New York!" "But just surrender to the weather gods & enjoy the extra time there!" Look, I'm an adventurer. I don't mind being a bit of a vagabond, staying wherever & with whomever & living out of a suitcase for awhile. I'm about this hobo life sometimes, & it often feels strangely comfortable to me. But man, having to reschedule your flight for two days after you meant to leave - & still doubting you'll be able to leave then - is really just not ideal. It's exhausting not to have any idea when you'll get home. I canceled a hair appointment. I have to take my therapy appointment by phone. I will work from not-my-home tomorrow with a 3-year-old & a 6-year-old in the background (& probably often in the foreground). And if I can't get back to Ohio in time to use the tickets I won to a Cleveland International Film Festival event on Thursday night, I am definitely going to cry again. While none of these things are terrible, individually or even in the aggregate, it would be extra great to be wearing sweatpants in my bedroom, you know? I've been relying on other people's hospitality for more than a week now, & I would rather like my life back. Also, despite the fact that I own three pairs of snowboots, all said pairs of snowboots reside in Ohio. That's why today, I stopped into a ritzy sporting good store & dropped $140 on a new pair, just so I can function in a likely-to-be-snow-covered city. Unfortunately, due to increased demand by stranded tourists like me, the store only had one pair left in my size, so I ended up buying the most hideous snowboots known to man. Except now Weather.com reports that NYC is apparently only supposed to get 5-8", which hardly seems snowpocalyptic. Thanks for a great week & for all your hospitality, NYC. I love you, but I'm feeling pretty ready to leave you.